Doesn't logout if ESC is pressed / Trades are called. Hi! Your script works wonderfully, thank you very much! I just have one problem of with low HP log out, since my character is an archer with low life and armour, is it possible to change when my HP drops to 70 or 60% it will log me out? Other than that its very good thanks! Edit: Also does this script work with fullscreen? Thanks. hi there, nice script. I downloaded it and all works well! 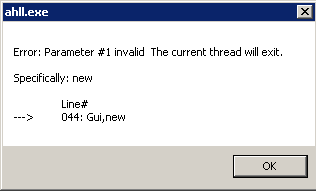 Even without making any changes, just taking your script and compiling it I get this error when pressing F4. I understand that 'gui, new' is responsible for creating a new window, any advice? Hey! Great script; however, I am unable to autoexit when my health goes below 35 and autoflask below 50. I pulled PoE up, right clicked the taskbar icon, and hit Windowed (Borderless), but no popup came up except one stating "Borderless (No Borders)." 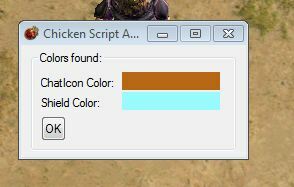 Start the script with F4, should receive a popup displaying the colors found (should be orange/red), that means its on. Sorry to be a bother again, but why does it sometimes quit PoE after logging out? Because it sometimes sends the commands so fast that graphically the screen can't keep up, so it may send esc, etc again and the second esc will trigger the exit. It's an unforeseen consequence, but trying to fix it with sleep etc, may break the script making it useless. It doesn't happen often but it can happen, try to make a strong character so it won't need to save you loads of times that will lower the chances of it happening. I am having frequent FPS drops while the script is running. Constantly my frames will go from 60 to 30. Is there anything I can do on my end that may be causing the problem or is this something that occurs whenever running a script? double ESC is log out, how can i change that?